Stone Harrison never knew he had an aunt; he certainly never expected her to bequeath him one of the largest spreads in central Nevada. 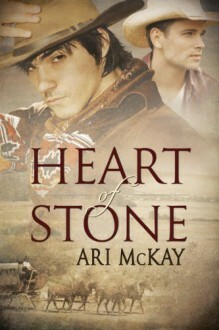 But something about Copper Lake Ranch and its foreman, Luke Reynolds, speaks to him, offering a chance for the home he’s never really had.Luke wants Stone to succeed as a rancher and put the legacy of his shiftless father behind him, but he’d also like Stone to share his bed. Unfortunately, Stone is convinced that the world is a harsh place that will never accept two men sharing their lives. Much to Luke’s dismay, he refuses to risk Luke’s life despite the intense attraction they share.The tension between them escalates when a series of calamities strikes Copper Lake. An unexpected and unwelcome visit from Stone’s dandified cousin, James, only makes things worse. Stone’s ability to run the ranch comes into question, but the threat of losing it means less to Stone than the threat to Luke’s life. Stone will do anything it takes to protect the man he loves—even if it makes him a murderer.